1. Ride in bigger gears. Riding in bigger gears at the same cadence in a particular set of conditions makes for a consistently higher power output. You can apply this tip by spending progressively longer time in a bigger gear during a typical ride. For example, if you normally ride up a local three-mile hill in a gear combination of 34 x 19, you can increase your gearing to 34 x 17 for three minutes (this assumes you’re riding a bike with a 50/34 crank and an 11/28 cassette). The next time, ride in 34 x 17 for four minutes and then five minutes, etc. until you can ride the entire hill in 34 x 17 at the same cadence you previously held in 34 x 19. This would indicate a significant increase in power! Riding uphill is a great way to increase muscular endurance, which is the ability to pedal a relatively large gear at a moderate cadence for an extended period. It’s effective because cyclists tend to reduce cadence and increase average effective pedal force when riding uphill (i.e., push harder on the pedals). One way to significantly boost your power output is to progressively overload climbing distance. 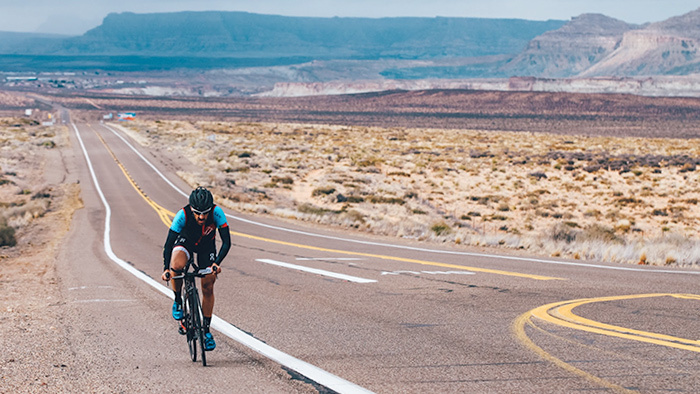 For instance, start by doing hilly rides with 1,000 feet of climbing and slowly add distance until you can complete 3,000 feet of climbing in a single outing. Another way to enhance power is to do short, high-intensity sprint intervals up steep hills. These sprints should last between 60 and 90 seconds. Simply ride downhill to recover and then sprint up again. Build up to 12 sprint intervals in a single workout. If you live in flatlands, riding uphill is not going to work for you. Fortunately, riding into the wind can be just as effective. As with riding in bigger gears and riding uphill, it’s a great way to improve muscular endurance. Of course, you can’t plan a headwind ride in advance, but you can take advantage of a windy day by riding a rectangular circuit about two miles in length. This will provide you with consistent periods of headwinds, tailwinds and crosswinds. Your objective is to accelerate into every headwind. Pedal a moderately large gear at about 90 rpm and hold that effort for the duration of the headwind. Recover when you have a tailwind and crosswinds. Block training consists of very hard workouts for two or three consecutive days followed by an equal amount of recovery (days off or very easy workouts). Because of the severe stress placed on your musculoskeletal and cardiovascular systems, block training is a very effective way to facilitate the physiological adaptation process and significantly boost your power. The key is to make sure you give your body enough time to recover after the training block. For example, you can do a four-day training block that consists of hill intervals (Day 1), sprint intervals (Day 2), a day off (Day 3) and an easy recovery ride (Day 4). Likewise, you could perform a racing block that includes a criterium on Saturday and a road race on Sunday followed by a day off and an easy recovery ride. In both cases, you have subjected your body to consecutive days of high-intensity effort followed by easy recovery days. Always make sure you have fully recovered from a training block before you attempt another high-intensity workout. 5. Follow the 75-percent rule. The 75-percent rule states that during a given training week, at least 75 percent of your miles (or time) should be at or below 75 percent of your maximum heart rate (MHR). In other words, at least three-fourths of your weekly training should take place in Zones 1 and 2 (50-70 percent of MHR, 65-85 percent of lactate threshold heart rate and a maximum of 75 percent of functional threshold power). That’s right, most of your cycling should consist of easy recovery and endurance building rides. So how do you get faster? That’s the other part of the 75 percent rule. Ten percent of your weekly mileage should be in Zone 5 (90-100 percent of MHR, 105 percent of LTHR and 106 to 150 percent of functional threshold power). In other words, it should consist of really, really intense riding. This is what allows you to modify your physiology—A relatively small amount of very intense effort combined with endurance work and adequate recovery. Stay tuned for five more simple ways you can increase your bike power.